Original Caption: Older Citizens, Retired Persons and Those Unable to Care for Themselves Physically Are Cared for in Two Community Centers. 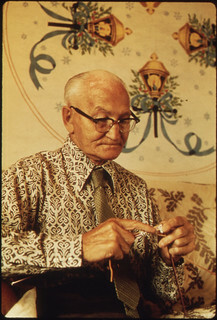 This Man Lives at the Highland Manor Retirement Home, Keeping Busy with "Old Country" Crafts. New Ulm Is a County Seat Trading Center of 13,000 in a Farming Area of South Central Minnesota. It Was Founded in 1854 by a German Immigrant Land Company That Encouraged Its Kinsmen to Emigrate From Europe.